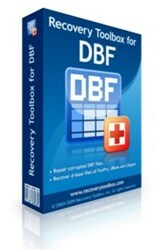 Recovery Toolbox, one of the major suppliers of reasonably priced, yet efficient, convenient and easy-to-use recovery tools for popular software of different types, is pleased to announce the availability of the most recent and advanced version of Recovery Toolbox for DBF, a powerful program for quick and hassle-free recovery of DBF file data. Created for regular users with basic computer skills and no practical experience with data recovery, the program features a friendly UI and a brand-new recovery engine. A powerful program for quick and hassle-free recovery of DBF file data. Recovery Toolbox (recoverytoolbox.com), a world-renowned supplier of functional, fast, yet intuitive and highly affordable tools for quick and problem-free recovery of files in a variety of formats, announces the release of a major update for Recovery Toolbox for DBF, a compact solution that offers users everything necessary for the recovery of DBF file data right on the spot and without leaving the workplace. Unlike specialized recovery services, Recovery Toolbox for DBF needs literally no time to restore the contents of a corrupted DBF file and the user never compromises the data stored within, since it never leaves the user’s system. The program was designed and developed for non-professionals and people with zero experience in data recovery – hence the simplicity of the user interface that is based on a step-by-step wizard. This convenient tool for the recovery of DBF data supports all versions of the DBF format and files created in all popular database applications, including dBase IV, Clipper, FoxPro 2 and Visual FoxPro. Thanks to an integrated database browser, recoverable content can be previewed before extraction. Among the items that are restored by Recovery Toolbox for DBF are the overall database structure, database records and data from MEMO fields (technically, from associated FPT or DBT files). For extra convenience, the program enables the user to select the format of the destination database file.